Award-winning author MariJo Moore asked women from around the world to consider the devastating nature of conflict—inner wars, outer wars, public battles, and personal losses. Their answers, in the form of poignant poetry and essays, examine war in all its permutations, beginning in 60 CE and continuing into the 21st century, from Ireland to Iraq and everywhere in between. 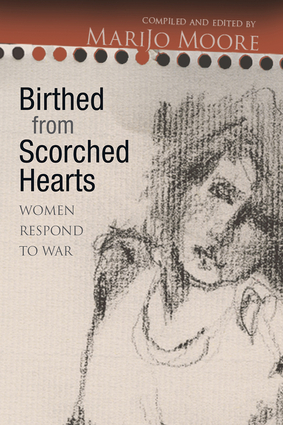 With contributions from both well-known and first-time writers, this moving anthology encompasses a wide range of voices—a Blitz evacuee, an ex-slave, an incarcerated mother, former military personnel, survivors of domestic violence, those who have battled drugs and disease, and many other courageous women willing to share their unique and timeless insight on the realities of war. Review By: Tom Kerr, On The Issues Cafe - January 5, 2009Birthed from Scorched Hearts will make some readers feel... heard, vindicated, empowered or inspired to reevaluate their perception of war and their passive acceptance of it within society. All readers have the rare opportunity to question the current human condition with a view toward the betterment of all.